Map Samples - 2010 Maps of the Month - Maps & Facts Unlimited, Inc.
Maybe this recession will convince developers, investors, lenders, planners, and politicians that Phoenix is not New York or San Francisco. 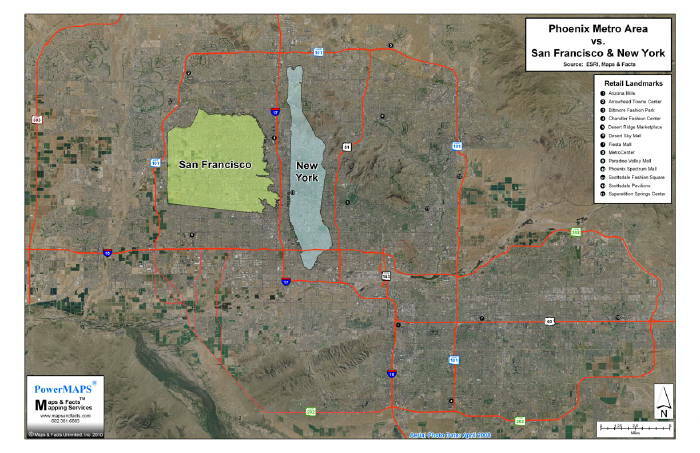 As this month’s map shows, just the City of Phoenix is 20 times larger, geographically, than New York City (Manhattan). Density and height are not the answers. A recent article in The Arizona Republic discussed the turf war among Fresh-Mex chain outlets. 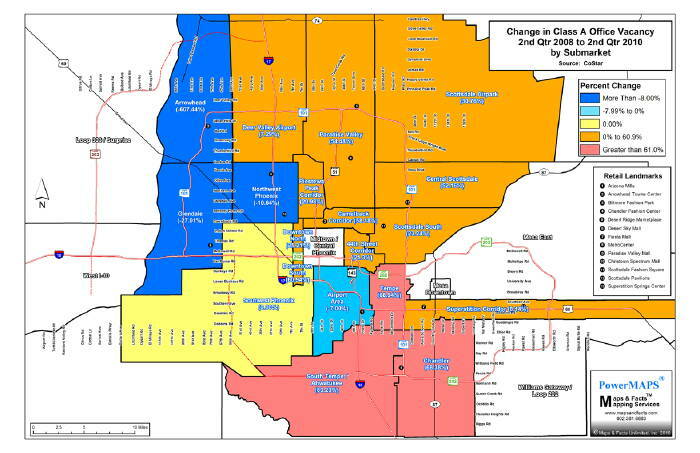 This month’s map shows their locations, including expansion sites, superimposed on Household Income by Census Tract. Based on all the “Green” locations, it looks like they know what they’re doing! 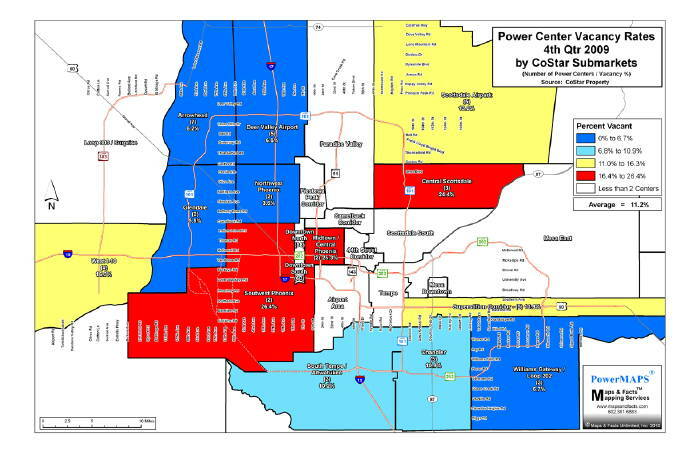 Power Center Vacancy Rates: Beware of Averages! 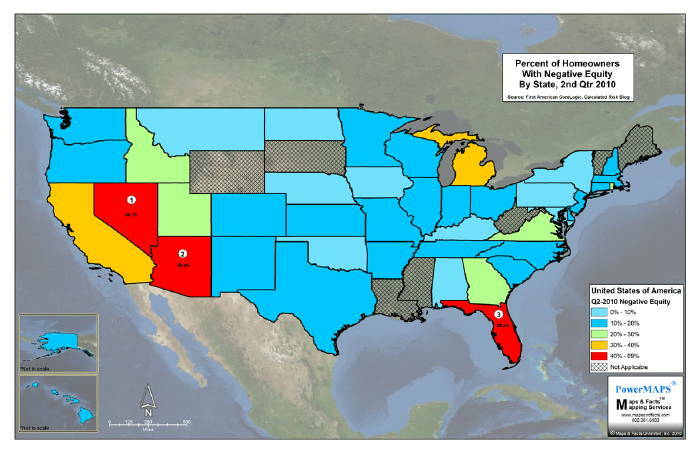 This month’s map shows Power Center vacancy rates by submarket per CoStar. While the average vacancy rate for all 52 Centers is 11.2%, the 3 red submarkets have vacancy rates north of 24%. Anchors aweigh? This month’s (aerial) map depicts, the only directions in where future growth can occur due to land ownership patterns. Responsible prognosticators have prognosticated that the “Sun Corridor” will add an additional 5,000,000 people by 2040. Where will they (we) live? 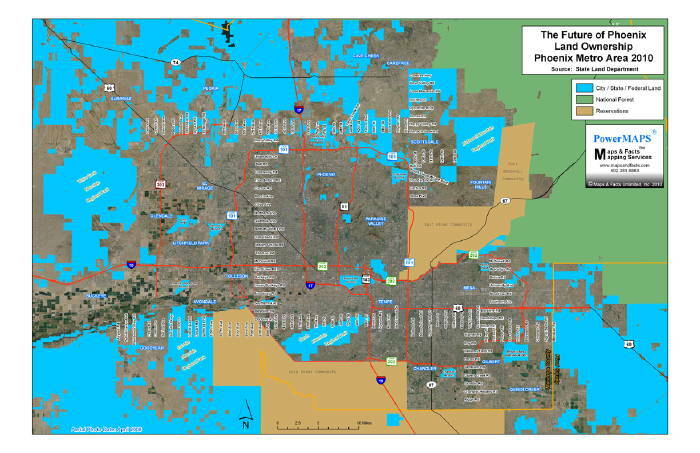 Based on Phoenix land ownership patterns, there are only three (3) likely directions: West along I-10 towards Buckeye; Northwest along Grand Ave. towards Surprise; and, Southeast towards Queen Creek and ultimately Pinal County. If you would like a close up of a smaller area, please call and we will try to accommodate you at no cost. This month’s map depicts the change in value since 2004 for $1 Million+ houses which have re-sold in a recent 6 month window. If you bought your castle before 2005, today it is probably worth what you paid for it! 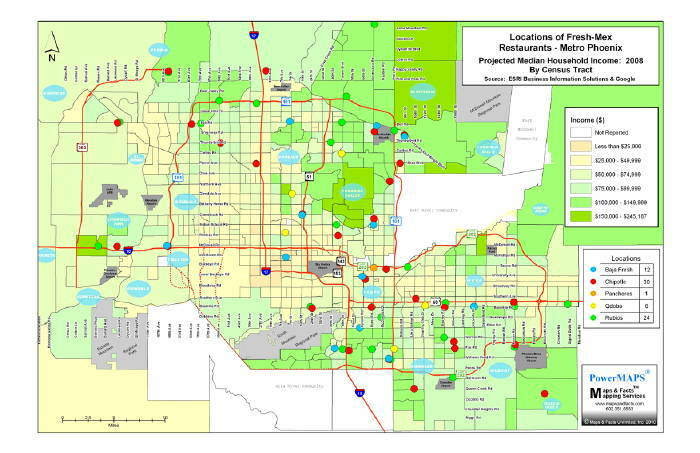 This month’s map compares Metro Phoenix’s population density with NYC ( Manhattan) and San Francisco. 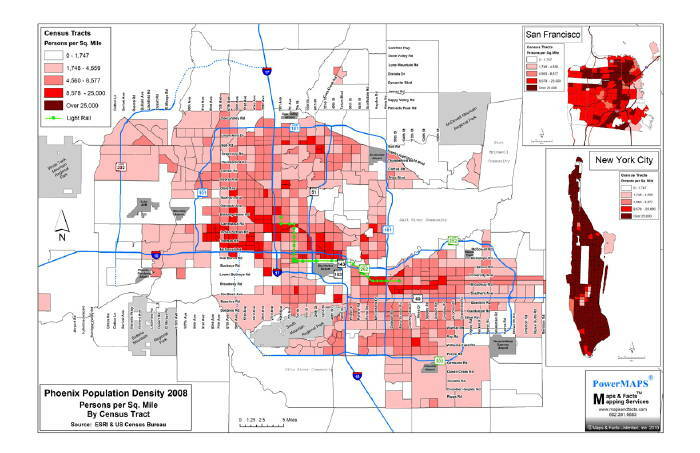 As can be seen, there are no census tracts that even come close to the average density of NYC or San Francisco. Real estate success/failure starts with absorption; which is a function of location and product. We don’t think it’s a coincidence that many high density Phoenix real estate projects have failed; even in the good ole days. This months’ Map of the Month addresses the change in Class A office vacancy over the past 2 years by CoStar submarkets. 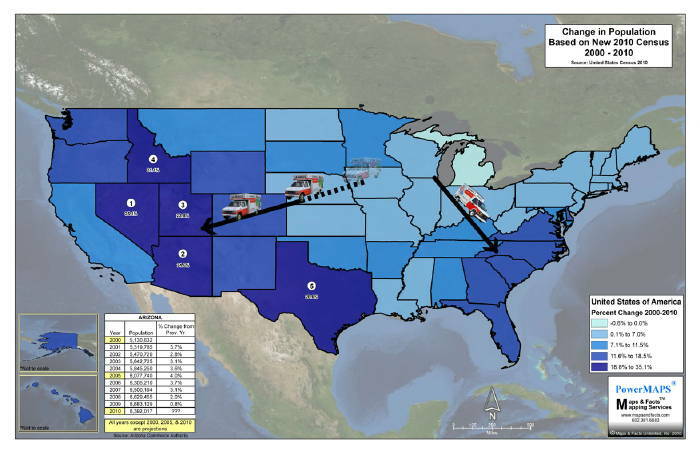 As shown, only the Arrowhead, Glendale, Northwest Phoenix, and Airport submarkets improved; presumably due to little or no new Class A inventory added and smaller Class A inventories. For the most part, the other submarkets have significantly higher vacancy rates today due in part to the addition of new inventory that had been under construction, and, today’s historically depressed office market conditions. To the extent there is a correlation between job growth and office demand, Phoenix’s job growth must be negative? For the past year or two, apartments have been the hottest (and perhaps only?) product in the institutional commercial real estate arena. This month’s map shows those submarkets experiencing higher occupancy (Red), and, those submarkets experiencing lower occupancy (Blue). While not shown, it is no surprise that the majority of the A & B quality sales are in the Red submarkets. 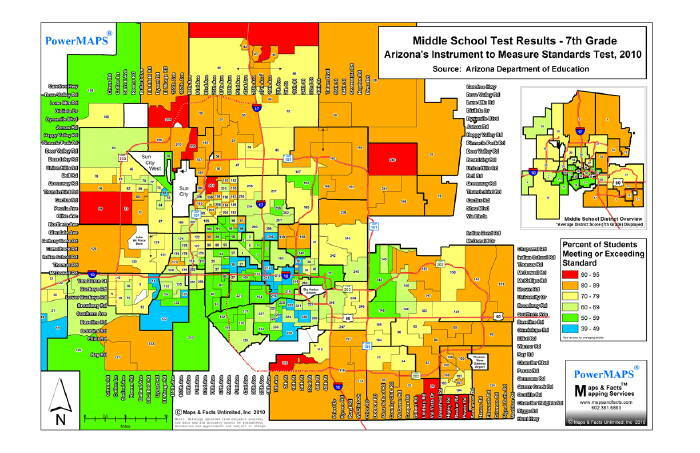 This month's map compares the 2010 Middle School AIMS Test Scores by attendance boundaries. Because the differences are sometimes small, we have also included via the download link the individual schools and their Maps & Facts averaged test scores. This will also be available on our website. We are working on our 20" x 30" Elementary / High School folding maps which will be available in about one month for $9.95 each. Pre-orders can be made by emailing info@powermaps.com. If you would like to order a set of maps with your logo, please contact us (minimum 100). 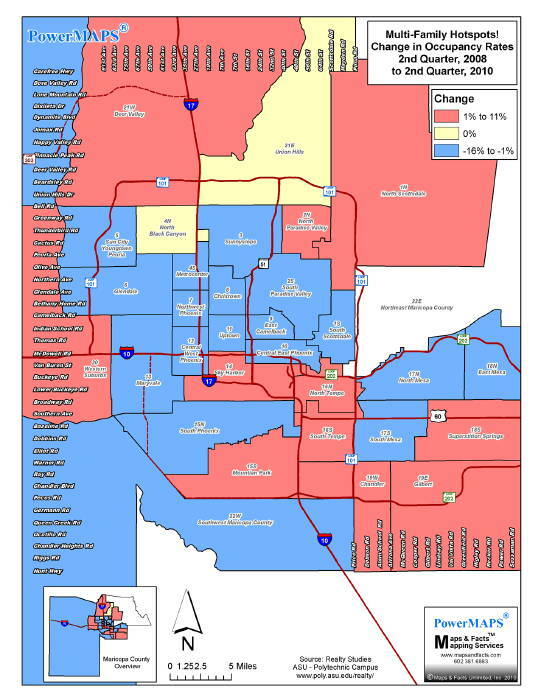 This months map shows that Arizona is second only to Nevada for homeowners with negative equity. While the data may be selective based on its availability and its statistical confidence level may be low, presumably the methodology was similar for all states. Thus, the relative comparisons should be valid. 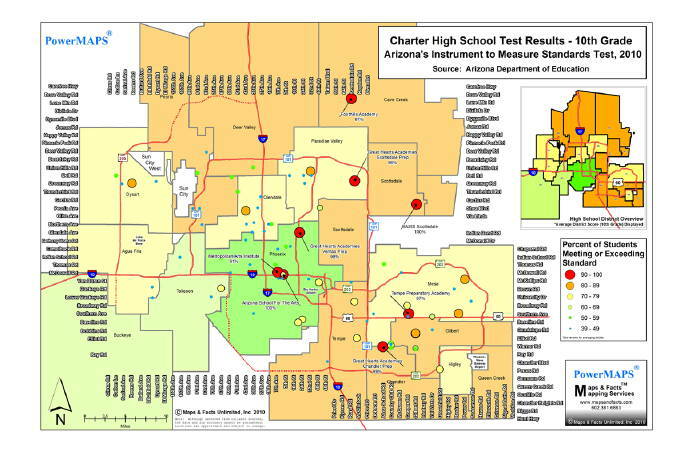 Reportedly, 10% of Arizona students attend Charter Schools. While recognizing that Charter Schools have specialized curriculums, we were interested in comparing Charter School AIMS Test performance with Public School AIMS Test performance using the same color code criteria we use for our public High Schools Map (http://www.mapsandfacts.com). As seen, based solely on the AIMS Test scores, there is only a slight correlation. Several of the highest performing Charter Schools are located in "Underperforming" Public School Districts. Arizona: 2nd Fastest Growth State! Arizona has historically grown itself out of recessions. If history repeats itself, by 2020 Arizona will still be one of the fastest growing states; but at a much slower fastest! 1. Arizona as the 2nd highest growth state. 2. The 5 highest growth states are located in the West. 3. The next highest are in the Southeast. There is nothing on the horizon to indicate that this trend won't continue, though at a slower pace. The pace has already slowed. As the inset shows, while the total net population increased by 24.6% from 2000 to 2010, most of the increase occurred between 2000 and 2005; (20%). Based on the actual (not projected) 2010 data, the 2006 to 2010 projections were much to high. The actual change from 2005 to 2010 was about 5% or 1% per year on average. Assuming that in-migration didn't slow until 2007/2008, from 2008 forward new population growth was flat or even declining. Happy New Year from The Paul G. Johnson Company and Maps & Facts!